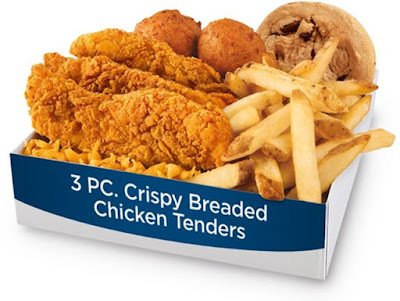 The $5 Real Deal Box promo is back at Long John Silver's for a limited time and brings along with it an additional chicken option, new Crispy Breaded Chicken Tenders for slightly more choices. The new tenders offer a lightly fried breading and is slightly different from the chain's classic battered chicken. You can now choose either three Crispy Breaded Chicken Tenders, two pieces of battered fish or chicken tenders, or one piece of battered fish and three shrimp to go with an order of natural-cut fries, two hushpuppies, a 20-ounce fountain drink, and a chocolate chip cookie for $5. The $5 Reel Deal box can be found at participating locations nationwide through May 28, 2017. Photo via Long John Silver's.